While we were playing, we were filmed (openly so, we said we were cool with it). We were told that the video would go online. “Awesome” we said “we are from the future, we are cool with that”. We were given a shiny laminate with a code on it “get your video guys, tell your friends”. “We live in public” we said “we are digital natives”. And off we went to get some WiFi so that we could Tweet our LOLs to you all. That’s when we hit a problem. Before we could even login, we needed Silverlight. Not even to watch the video, to get into the website. So today I dug out the pass number, and did all the install stuff. I watched the video. It was funny. There was an option to share it, which basically posts the link to Facebook. So now all my friends need to get Silverlight too. What is this, a social media trojan being used to deploy system bloat or a funny video of me jumping around? I took the time to screen capture the video using iShowU. So now I can share my LOLs. Microsoft, this took me a bloody week and I had to download two new pieces of software so that I could tell people how fun your toy is. Frankly the moment has passed. Don’t make my life hard for me, guys. I wanted to share that moment with people. I wanted to give you the beautiful gift of my friends attention and what did you do? You stuck a big stupid browser bolt-on in my way. This wasn’t the time or place for us to have the conversation about downloading Silverlight; this was the time for me to get a video, share the link, embed it in my blog… all the while amping your product. YouTube has a place. This was it. Keep it simple. Put the video on YouTube, and then give me a shortened and personalised URL. I checked and kinect.ly was available. Buy it quickly. And next time, give me the tools to spread the word for you, don’t waste the moment for a lame piece of synergy. If you’re in any doubt the video is of us playing the adventure game, and I am OWNING Ms Jones at it. 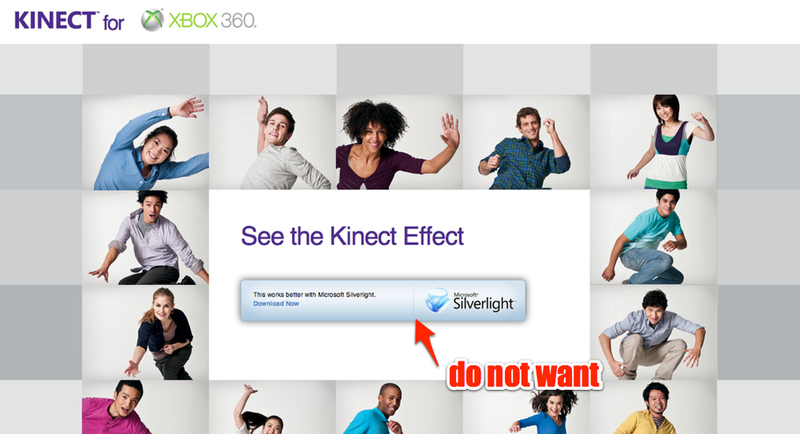 They seem to be pushing Silverlight all over the place, at the obvious expense of their own marketing strategy. I had to download it to use the new Fable III: Kingmaker app last week (which incidentally doesn’t work anywhere close to the way it ought). Why do I have to leap through hoops to play a bloody clunky flag planting game (which should, by rights, have been a genuinely enjoyable augmented reality tie-in) which is only a marketing tool for the real product, that is to say Fable III? I’ve gone from being really excited about the release to not expecting much from it, mostly because of how shite Kingmaker was, and having to download an add-on I don’t expect to ever use again in order to find out. Bah! Thanks Andy, interesting to here this happens across the board in MS promotional campaigns. Quite the fail. Bang on the money, Jon. MS were just starting to prick up my ‘not at work’ ears, with new and improved products like Live, Office etc. But now I think of it this is via old-marketing high street billboards, posters and *new* tech like email! I think to myself, I’ll have to remember to look that up. And I never do. Even Apple Fan Boys are praising Windows 7 on twitter. They’ve got a lot of big things happening but they’re keeping it secret.Defo room to embrace social media. Previous Previous post: LinkedIn has a language problem that is actually meaningless. So get over it.